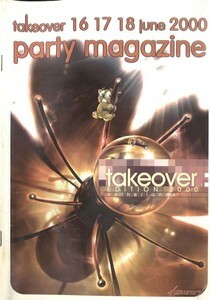 description: Brochure given out to the visitors of Takeover demoparty, taking place 16 to 18 June 2000 in Eindhoven/The Netherlands. notes: This is a fully-fledged, 50-pages magazine prepared by Takeover organisers for the party visitors. Apart from event-related information, it features several articles (including one on chiptunes by Rez) and a double-interview on party organising with The REW and Dr. Yes (organiser of the LTP demoparty).